Importance. -- This wasp is among over 600 gall insects that attack the oaks in the United States. 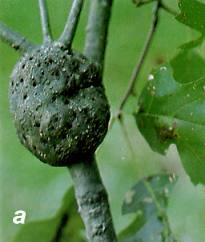 Gouty oak gall is most common on scarlet, red, pin, water, and black oaks. 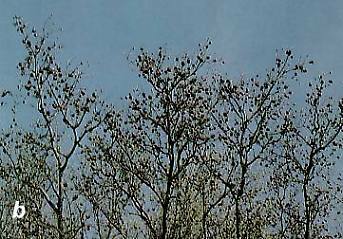 In heavy infestations, twigs, large branches, and occasionally entire trees may be killed. Identifying the Insect. -- Adults are small, black, cynipid wasps with an oval, shiny, and slightly compressed abdomen. The larvae are white and globe-shaped. Identifying the Injury (figure 40a). -- Galls are irregular, globose, woody, 1.5 inches (38 mm) in diameter, and encircle the twigs and small branches. They sometimes occur so close together that they form nearly continuous masses (figure 40b). Biology. -- This species has alternate generations. The first produces small blisterlike galls on leaves in the spring. The second produces gouty galls during the summer. Control. -- Natural controls are generally adequate. Prune galls from small trees and destroy. Figure 40. -- (a) Close-up of single gall showing gall insect emergence holes; (b) trees heavily infested by gouty oak galls.